Parade – Ephraim Main Steet, 10:00 a.m. Car Show – 11:00 – 4:00 p.m. 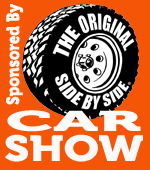 Awards Presentation – 3:00 p.m.
Prizes will be given for each of the top divisions and one grand prize for Best of Show, courtesy of sponsors Original Side By Side, EcoLife and Roys Pizza. All car show entries should line up for the Grand Parade at 300 South Main Steet at 9 a.m. Parade starts at 10 a.m. Registration is $25, which includes a t-shirt, parade entry and swag bag.